For facts behind the slogan, theory states that unless you bring your heart rate over 70% and sustain that effort from 20 to 60 minutes at least three times a week, you won’t be achieving any results. This kind of intense activity can be beneficial for those who seek high performance and aerobic capacity but, contrary to common belief, it doesn’t have to define everyone’s aim. 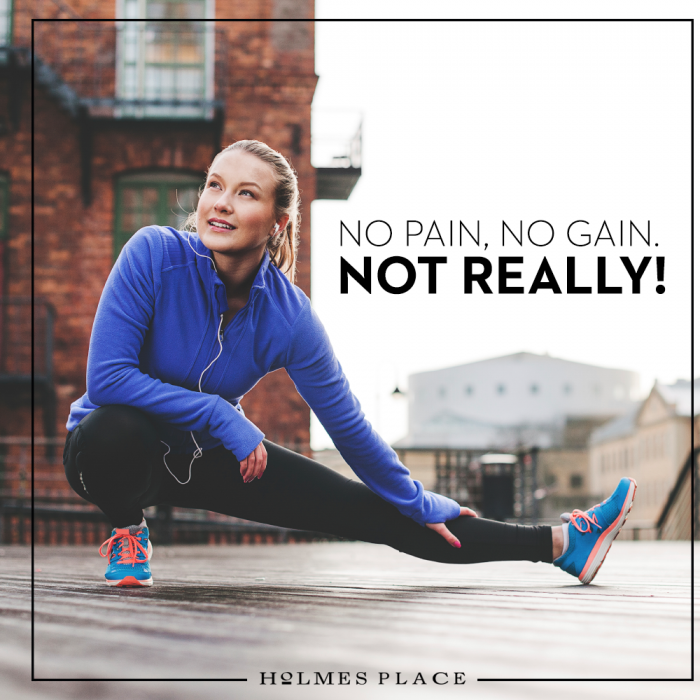 The truth is that this level of training, along with the ‘no pain, no gain’ slogan, often discourages people. They assume that exercise is beyond their reach. Exercise doesn’t have to push you to your limits to have a positive influence on your health. Effective physical activity can be rated by intensity, duration and frequency. So if you’re not working out as intensely, you can increase the length or the amount of times you exercise. In this way, a moderate walk can equate to a run, with the same health and fitness benefits. You really don’t have to be drenched in sweat and counting your heart rate to feel you’re doing it right. Furthermore, if you opt for an exercise style you enjoy, you’re more likely to keep at it and make time for it in your busy schedule. If your exercise of choice is not as intense as others might choose, don’t worry - that doesn’t decrease merit or results. Remember, if you include walking (about 100 steps per minute is a nice brisk pace) or climbing the stairs instead of taking the elevator, you’re already focussing on your health and burning calories as part of your day to day routine. Combining these with a routine at your club means you’re taking steps towards even better health and making sure you live a longer and healthier life. Whether you exercise on your club’s treadmill, in the countryside or in the city streets, what really matters is that you’re taking the time to do it - and it will pay off.